Just one year after the final phase of an ambitious operation to rid Desecheo NWR of introduced, damaging (invasive) rats, conservation biologists have confirmed that these predators are absent from the island, and the operation was a success. This project, the largest conservation operation of its kind to date in the region, would enable the island to return to its former and rightful status: the most important seabird colony in the region. The refuge lost this status due to the presence of invasive mammals for almost a century. Desecheo NWR was once the largest Brown Booby (Sula leucogaster) and seabird breeding colony in all the Caribbean. Its storied history includes early Western observers (circa 1878) documenting strange black clouds above this towering island 13 miles west of Puerto Rico. As those explorers neared the islands, the “clouds” came into focus, turning out to be a cacophony of tens of thousands of seabirds. Unfortunately, invasive mammals, including goats and rats, began to impact Desecheo NWR early in the 20th century. Around and during the time of World War II, the island was used as an artillery range by the US Air Force. That and the invasive species’ damage to Desecheo’s ecosystem have been severe, and by the turn of the millennium, virtually no seabirds were using the refuge. In response, the US Fish and Wildlife Service (USFWS), Island Conservation, and other key partners, including the US Department of Agriculture (USDA), and Bell Laboratories and Tomcat, have made the island safe once again for seabirds, the island’s endemic lizards (Ameiva desechensis, Anolis desechensis, and Sphaerodactylus levinsi), three endemic arachnids, and the federally Threatened Higo Chumbo cactus (Harrisia portoricensis)! “It is with great excitement that we announce this historic conservation achievement; the operations to rid Desecheo NWR of damaging invasive rats is a success,” said Susan Silander, Project Leader of the Caribbean Islands National Wildlife Refuge Complex. “For many years, in collaboration with all our partners, we have fully invested our time and spirit to successfully achieve these results for the benefit of the refuge and its native animals. We hope such efforts will serve as an example to other conservation entities doing similar types of work. Island Conservation’s José Luis Herrera, Confirmation Monitoring Trip Leader reported that Desecheo had experienced a lot of rain this spring, which, combined with the absence of rats, allowed the team to observe an island that was thriving like they had never seen! The team also observed increasing numbers of Threatened Higo Chumbo cactus—some flowering and fruiting. Desecheo’s recovery is critically important for this rare cactus because it its range is extremely limited with only two natural populations outside of the refuge. The removal of invasive rats from Desecheo offers hope for the recovery of this vulnerable species. Desecheo NWR has seen many stewards over the years, including Spain, Puerto Rico, the US Military (military training activities), the National Institute of Health (N.I.H.) for medical research, and the US Fish and Wildlife Service. At one time, the largest Brown Booby nesting colony in the world. Today, little seabird nesting takes place on the island. The native forest (which includes the Threatened Higo Chumbo cactus) has been severely degraded by introduced rats, and goats. Much of the rocky terrain is covered by a native forest adapted to a dry climate. Large Gumbo Limbo trees are common in interior valleys while a variety of cactus species, including the Endangered threatened Higo Chumbo, form a part of the thorny scrub vegetation covering the steep coastal slopes. 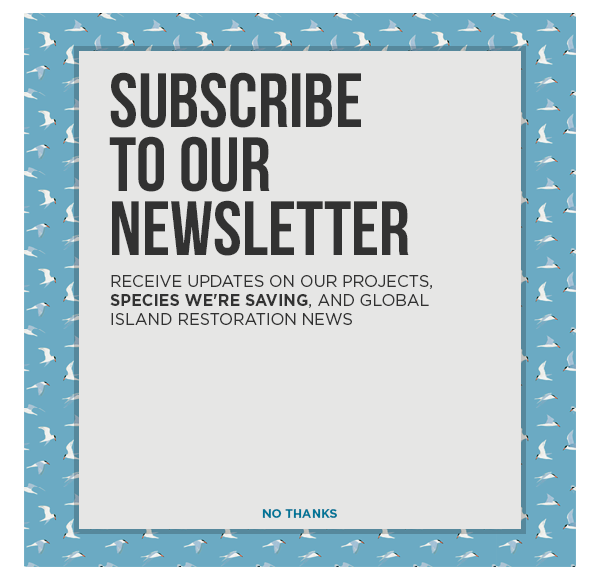 Island Conservation, a non-profit organization dedicated to preventing extinctions by removing invasive species from islands, is a partner with the US Fish and Wildlife Service in the plan to restore Desecheo Island by removing invasive rats. The US Fish and Wildlife Service is the principal federal agency responsible for conserving, protecting, and enhancing fish, wildlife, and plants and their habitats for the continuing benefit of the American people. Please visit the Service’s website at http://www.fws.gov/caribbean/refuges. Funding for this project has been provided by the US Fish and Wildlife Service and Island Conservation through many private donors, including the David and Lucile Packard Foundation, National Fish and Wildlife Foundation, US Federal wildlife conservation grants, and through important donations made by Bell Laboratories and Tomcat.